Are YouTubers changing how people come out? The online world has become a huge platform for young people. In particular there is a growing successful community of what have come to be known as ‘YouTubers’, people who make their living through posting material on the video sharing site. Zoe Sugg, Tanya Burr, Pixi Woo, are among many beauty gurus who make YouTube videos about make-up, fashion and lifestyle. Both Tanya Burr and Zoe Sugg also have daily vlogs which show their ordinary lives as do the SacconeJoly’s a family – mum, dad, two young children – of ‘daily vloggers’, who invite you to ‘be part of their journey. What is apparent amongst all of these videos is the embedded taken-for-granted nature of heterosexuality, yet, as Akile Ahmet shows in this post, YouTube also provides spaces for other ways of being. Most of us see the mass media as something from which other people need protecting. We, in contrast, view ourselves as having the strength to withstand its influence and the insight to see through its lies. Usually these other people are younger than us and they’re more likely to be male than female, and more likely to be working class than middle class. This tendency to see other people as vulnerable to media corruption has been found so often in research studies that it’s become called ‘the third-person effect’. In this post Heather looks briefly at how far this came through in our group interview data. 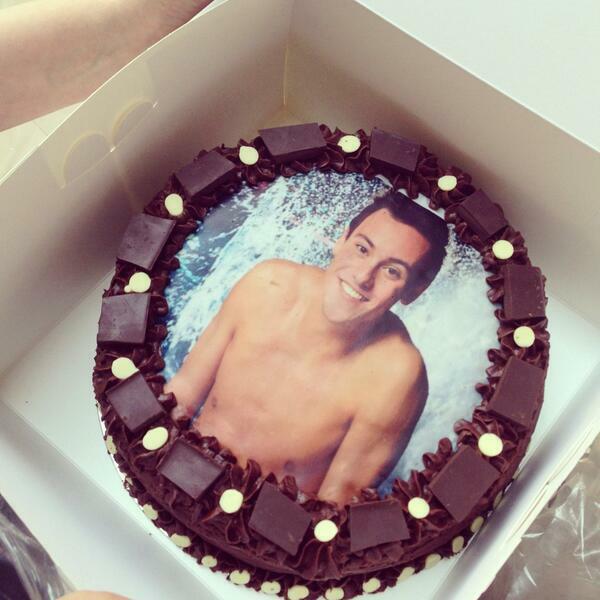 What something did Tom Daley want to say? Tom Daley is one of CelebYouth’s case study celebrities so we were very excited when he hit the news last week after uploading to YouTube the direct-to-camera video ‘Something I want to say’. In it, Tom tells us that despite ‘dating girls’ in the past, he’d not had a ‘serious relationship’ until last spring, when he met someone who makes him feel ‘so happy and so safe … well that someone [pause] is a guy’. We love this video. Heather in particular has crossed the boundary from researcher to fan as she’s studied Tom’s media representation including, reading an autobiography and biography, following the news coverage of him across six months and enduring every episode of TV-celebrity-diving-competition Splash! Her colleagues marked her growing interest by getting her a Tom Daley cake to celebrate her 43rd birthday (pictured). In this post she looks critically both at Tom’s ‘coming out’ video and at reactions to it, suggesting that the ‘something he wants to say’ constitutes a new kind of sexuality story and one to which we need to listen attentively. Fieldwork report one: What celebrities are young people into? After a lot of work finding schools, we have begun fieldwork and carried out six focus groups in two schools. In this post, we (Kim and Heather) share some of the things that surprised us in our 14 to 17 year-old participants’ talk about celebrities – from arguments about diver Tom Daley to animated discussions of classic Hollywood and Bollywood film stars.